Have you ever missed an important meeting? Cue feelings of panic and dread...activate excuse-making machinery...then finally comes acceptance. Maybe you were so engrossed in your task that you lost track of time. Maybe another meeting ran over and you didn't realize. And maybe, just maybe, this could have been avoided if the important meeting hadn't been camaflouged among your other meetings by your monochromatic Outlook calendar. The problem with lists, and your daily calendar view is basically a list, is that without doing anything extra, each appointment has the same appearance, regardless of importance. You could scan each item quickly, but that takes some extra time and mental processing power. Do you wish there was a way to highlight your most important meetings? Would it be helpful if they stood out with just a glance? And would it be valuable if this all happened automatically? The solution is to set up your calendar so your most important meetings are automatically displayed in a different color of your choice. Red is an obvious and fine choice, but any color with the desired impact will do. I know what you're thinking. This sounds complicated. And will I screw up my existing calendar? Not to worry. I'll hold you hand through the entire process. 2. Click on "View Settings"
3. 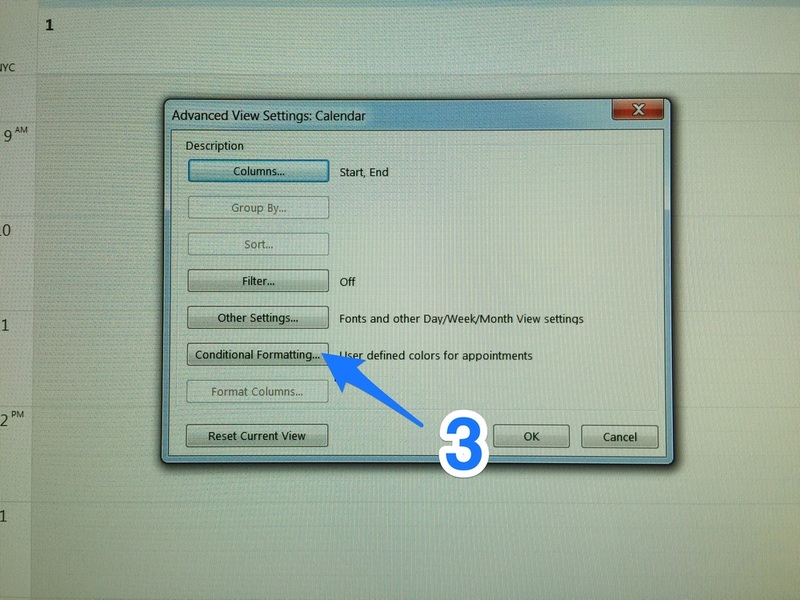 Click on "Conditional Formatting"
5. Name the color-coding rule you are about to make. So for example, "Exec mtgs" for meetings with you boss or senior management. And pick a color that will resonate with you as signifying something special and stand out. 7. No need to go crazy here. If you always want to highlight meetings where the CEO, say Mr. Albus Dumbledore is attending, then clock on the "Attendees" button and insert his name. My advice here is to keep the rule you are making simple. And now, according to the "Exec mtgs" rule I just created, any meetings with Albus Dumbledore as an attendee will now magically appear as red in my calendar. One the rule was set, I didn't have to use a single keystroke or think about it to make those meeting stand out from all my other meetings. First thing in the morning, I'm not at my best. My mind feels like it is paddling through molasses so that even simple tasks can be draining. I learned a tip from a coworker that if I put my computer to sleep instead of shutting down, I could skip the step of opening my applications in the morning. This helps automate my morning and jump starts my day. However, sometimes you need or want to restart your computer. Luckily, there is an EZPZ way to have your computer open the programs you use every day for you on Startup. This is how we do it.